Are your customers active on Facebook? 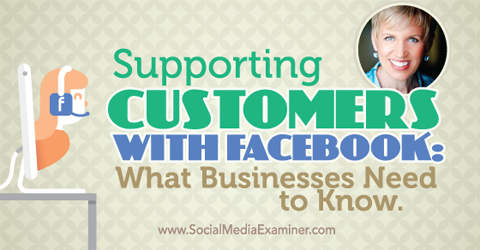 Have you got a plan to support your customers via Facebook? 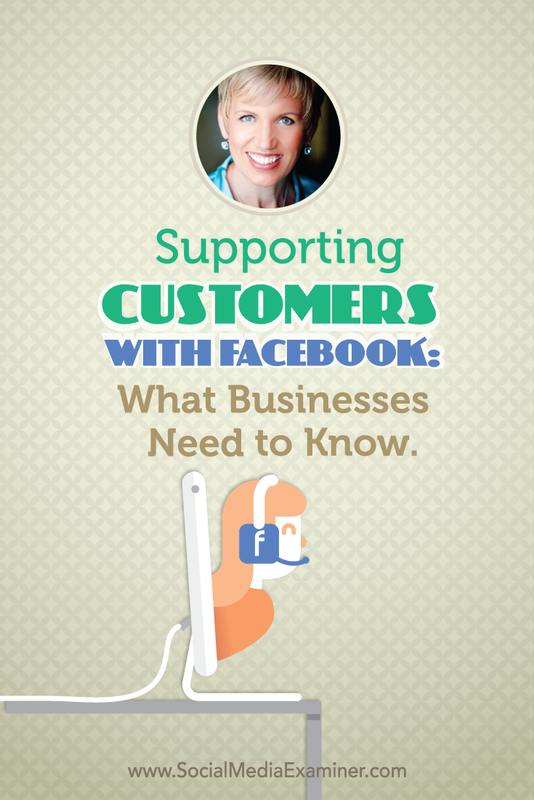 To learn how to use Facebook to support customers, I interview Mari Smith. In this episode I interview Mari Smith, the world’s leading Facebook marketing expert. She co-authored Facebook Marketing: An Hour a Day and is author of The New Relationship Marketing. Mari also teamed up with Facebook to assist in educational events. Mari will explore a few new updates from Facebook and how to use Facebook for customer service and support. You’ll discover how to create a good Facebook experience for your customers. Listen as Mari Smith shares what businesses need to know about supporting customers with Facebook. Mari believes Instant Articles were inspired by the video autoplay function on Facebook. Instant Articles, which make content more appealing, enticing and engaging, are only visible on the iPhone at this time. Currently there are only nine media partners that can create Instant Articles, which are posts that come alive with audio and movement on the page (animation, video). The New York Times, National Geographic, BuzzFeed, The Atlantic, The Guardian and BBC News are some of the publishers creating these interactive articles. Only nine media partners have access to Instant Articles right now. Mari also shares about the changes to Facebook Messenger. At the F8 Conference in March 2015, Facebook announced they’re opening up the Messenger API. This means any third-party developer can create an app that will work with Messenger. So if someone sends you a link to something in a Facebook message, it may ask you to install an app when you click on it. Messenger is also integrating with businesses, although there are only a few online merchants doing this as of now. With this functionality, when people make a purchase, Messenger will ask them if they want to get updates for this merchant via Facebook Messenger. That’s almost as good as having a person’s cell phone number, Mari explains, because there’s a high open rate for SMS messages. Using this technology, merchants can make purchase recommendations or send shipment updates via Messenger, for example. It basically opens up the dialog between the business and the customer. Listen to the show to hear how Instant Articles are similar to LinkedIn Publisher. Mari believes Facebook should be part of a business’s customer service plan, since most people are already on Facebook and many use Facebook through mobile devices. Mari talks about how she was recently interviewed for a Wall Street Journal article on how companies like JP Morgan and Coca-Cola are turning off voicemail, and cutting millions of dollars in expenses by doing this. Mari thinks it’s a sign of the times. The biggest challenge for businesses is that customers have so many different ways to contact them: a tweet or DM on Twitter or a Facebook wall post, comment or direct message. It can be unwieldy. Companies should also look at the features recently added for business pages on Facebook. The newest call to action button on ads is “Call Now.” Facebook wants people to call businesses. They realize if a phone is in someone’s hand, they can just press the Call button. The challenge is businesses would need to have staff on standby or a system in place to be able to handle the incoming inquiries. Listen to the show to hear how many minutes people average on Facebook every day. Mari shares a few things businesses need to do to help consumers find their page on Facebook. First, give your page an obvious and intuitive name, so when users search, they will find you. (Hint: Do your own searches on Facebook and Google to make sure your page comes up.) Also, include good keywords in the About section. Next, have a good cover image that you change regularly. Use the call to action button on your page, and possibly include text on the image itself. Mari includes the call to action button, as well as text on her cover image. Mari says businesses need to consider whether they should leave their wall open to posts. If your wall is open, customers will write on it. If your wall is turned off, customers are likely to comment on an existing post. If a major brand with millions of fans gets thousands of comments, it’s just not humanly possible to put enough staff on to manage them all. Your business may want to enable the Message feature, because Facebook strips out spam. Oreo, which has 40 million fans, keeps their Message button enabled. If a user sees “Message” on your Facebook page, they know they can tap it on their phone or click it on the desktop and write directly to the page admins. Oreo leaves the Message button enabled for their fans. Messages provide a golden opportunity for companies to develop relationships with the people who contact them. Note: the message must be initiated by the user. For managing messages, there’s a Facebook Mentions app for verified accounts (if you can use it, then you qualify) and the Facebook Pages app. Agorapulse, Spredfast, Sprinklr and NetBase are more for social media management and enterprise solutions. Listen to the show to discover the kind of app someone needs to create to manage page messages. If your page gets negative comments, respond quickly, apologize and ask the customer to email you directly so you can find a solution. Some community members don’t want help, they just want to complain. Those are the ones to watch out for. Mari talks about a recent situation where one of her fans, who was very upset about Facebook enforcing the real name policy, made continual comments to get Mari’s attention. Even though Mari’s team replied, the fan kept posting. He kept saying derogatory things about Mari and her business, because he was upset with Facebook. Even after Mari responded, he was still being difficult, so she banned him. This action deleted all of his comments. Mari says a situation like that happens less than once a year on her page. “When people are just being awkward and annoying, and you’ve given them what they’ve asked for and they still won’t let up, just get rid of them,” Mari suggests. Where spammers are concerned, in addition to blocking and deleting them, page managers can change the profanity and page moderation settings on their business page. To prevent spam, turn on the profanity filter and set page moderation to block posts and comments that contain certain keywords. If necessary, update the profanity section to block medium or strong language. Set page moderation to block posts and comments containing the keywords you determine. Listen to the show to discover how one of Mari’s clients handles customer service for their page. Mari says the number-one skill page managers need is emotional intelligence. It means that you’re able to make logical decisions, and avoid getting fired up. Emotional intelligence is a necessary skill for page managers working with customers. Image: Shutterstock. In this context of customer service on Facebook, if someone’s upset and their emotions are running high, the person managing your page needs to be able to realize the person is having a really bad day and not take it personally. Responding with emotion only makes things worse. “If you fight fire with fire, you’re only going to get more fire,” Mari says. Sometime you just need to go off-script and empower your team members to do so, if they need to handle a dissatisfied customer. Mari gives Zappos as an example that has done customer service well over the years. Their trained staff members spend their days talking to customers on the phone and providing exemplary customer service. They have a certain amount of elbowroom to make exceptions, such as delivery upgrades or bonus items. That’s an important aspect of training and customer service. You can’t have people reading off of a script, because it feels canned and makes customers feel like you don’t understand their situation. Listen to the show to discover why it’s important to turn dissatisfied customers into evangelists. Trello is a project management system that’s great for marketers. Trello lets you create boards and then cards with tasks inside them. Within each task, you can assign a person, a deadline, lists and more. Plus, you can @tag people involved with the project. Trello manages projects for marketers. Each person assigned a particular task can leave comments, attach notes and drag in images. It integrates with Dropbox and Google Drive. Trello is an awesome way to manage projects. For example, we were using massive, 100-page Google docs for our marketing plan, and it was unbelievably complicated and difficult to manage. Now with Trello we have different boards, and each board has multiple cards with batches of tasks on them. If Trello is open in your web browser or if you have the app on your mobile device, you immediately get an alert (or notification) whenever you’re tagged on something. If you act on it immediately, you won’t even receive an email. Trello is a sophisticated system that feels a little bit like Twitter, a little bit like threaded chats and a little bit of to-do lists and project management all in one cool app. And it’s totally free. Listen to the show to learn more and let us know how Trello works for you. Connect with Mari on her website and on Facebook. Learn more about Mari’s upcoming events. Read Facebook Marketing: An Hour a Day and The New Relationship Marketing. Explore Instant Articles, like Instant Articles on Facebook and see how they work. Learn about the F8 Conference, the Messenger API and how Messenger is integrating with businesses. Discover why JP Morgan and Coca-Cola are turning off voicemail. Check out the Facebook Mentions app and the Facebook Pages app, as well as Agorapulse, Spredfast, Sprinklr and Netbase, for managing page messages. Learn about Zappos’ exemplary customer service. What do you think? What are your thoughts on using Facebook for customer support? Please leave your comments below. 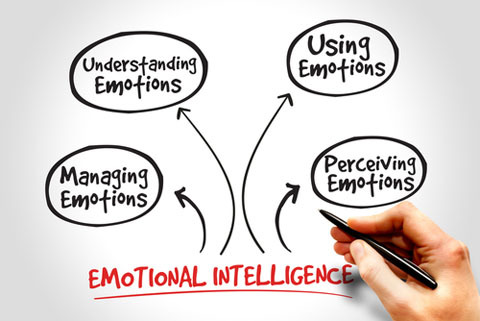 Emotional intelligence photo from Shutterstock. 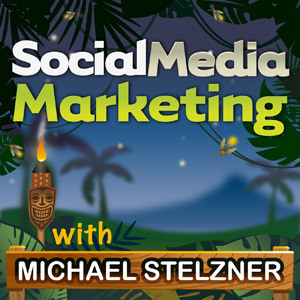 Mari Smith talks with Michael Stelzner about what businesses need to know about supporting customers on Facebook.